What's The Best 14-Inch Rough-in Toilet? How Do I Measure The Rough-in? Our Favorite 14-Inch rough In toilet? Installing a toilet is no easy feat. It requires plenty of accurate measurements, proper handiwork and know-how. The last thing you want is the hassle that comes with installing your toilet too close to a wall or too far away from the plumbing. While 12-inch rough-ins are more generally common than 14-inch rough-ins, they both have their merits, and sometimes you need to reduce the space taken up behind the tank, which is where a 14-inch rough-in comes in handy. In this article, we will guide you towards the best models available in the market and compare between them, and give our final recommendation at the end. So if you’re looking to install 14-inch rough-in toilets, then you’ve come to the right place. the Kohler K-3949-0 did not disappoint. 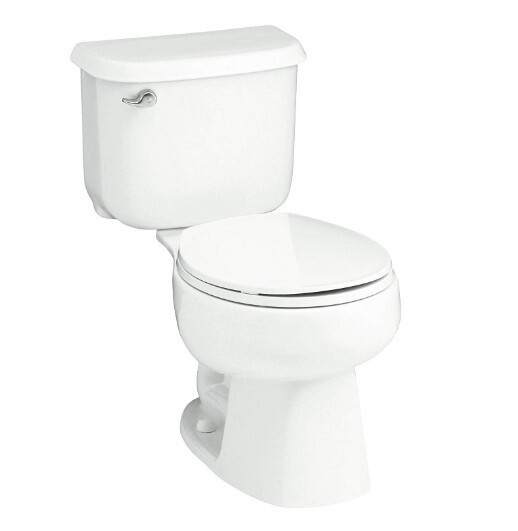 This model offers fantastic performance, with a elongated bowl and nice, crisp white finish. Using 1.28 gallons per flush, this toilet is designed to keep your water consumption at a minimum while also not compromising the power of your flush. 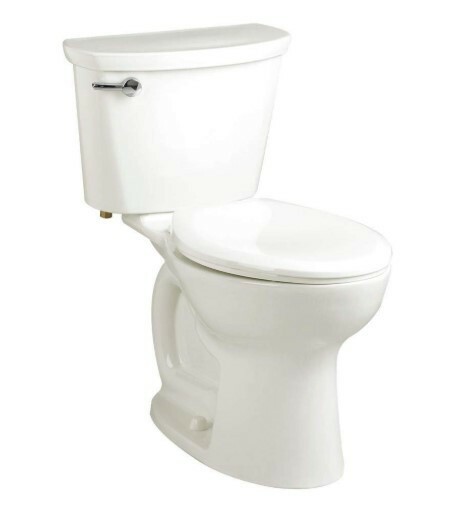 This model is one of the finest 14-inch rough-in toilets your money can buy. 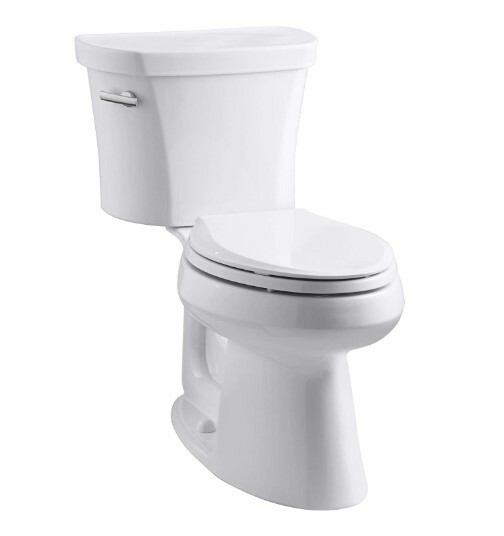 Similar to the Kohler K-3949-0, this toilet is eco-friendly and is designed to use as little water as possible without compromising the cleanliness of your toilet. It comes with a sleek, contemporary design and round toilet bowl. The one major downside to buying this toilet kit is that it does not come with a seat or a wax ring, which have to be bought separately, so make sure you plan around that if you’re tempted to purchase this unit. American Standard has built up a reputation of being reliable, versatile and fashionable. This model offers exactly those three things. A compact, elongated seat coupled with a simple, white finish makes this unit fashionable but also very effective. As with the two other models we talked about, this toilet uses 1.28 gallons of water per flush, making it more eco-friendly than its other, less economically-conscious counterparts. On a side note, it’s good to see that most major toilet manufacturers are making this step towards reducing water consumption. One thing that is concerning is the number of order shipments that American Standard seem to confuse. Reading reviews on this product, it seems that this is a common error, which is disappointing, especially considering that this is American Standard we are talking about. 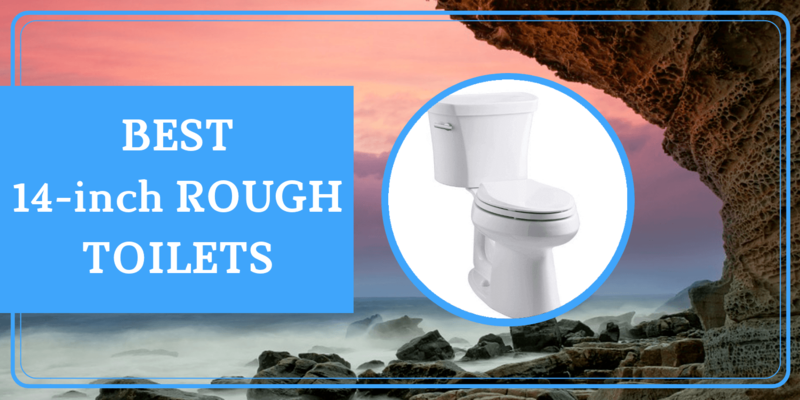 Before we get into what measurements you need to install your toilet and how you get them, it’s important to explain what is meant by a rough in. A toilet rough-in is the distance between the wall behind the toilet and the center of the outlet pipe where the waste leaves the toilet. As you might know, the standard in American toilets in 12 inches, but there are some at 10 inches and others at 14 inches. It very much depends on where the outlet pipe is from the wall. The answer lies within the measurements. To measure this, you need measuring tape and a steady hand. Stick the tip of the tape to the wall (make sure you are touching the wall and not the molding underneath it, as this can alter your measurements and they need to be accurate). Measure the distance from the wall to the bolt caps at the bottom of your toilet. Keep in mind that if you have thick walls because of drywall or anything of the sort, you have to account for the thickness of the wall. Water Consumption: The level of water consumption of a toilet is something that is essential to consider before you pull the trigger on a purchase. The last thing you want is a toilet that consumes more water than is necessary. Not only is a higher running cost for you, but it’s also not great for the environment. However, like we mentioned earlier, most toilet manufacturers are leaning towards making their toilets more eco-friendly, so you’ll find that most modern designs use less gallons of water per flush. ​​​​Bowl Shape: Toilet bowls come into two main shapes; round or elongated. Most people prefer elongated bowls, as they tend to be more comfortable, but round bowl toilets are useful for bathrooms with limited space, as they take up much less room than their elongated counterparts. Therefore, it’s worth considering which shape you want to go for. ​Price: This is something you should already be doing before buying anything, unless you’re a millionaire, in which case, can I have a million dollars? No, but for real, you really do have to consider the value of the purchase before making it. Furthermore, the unit price isn’t the only cost you have to consider. The cost of installing the unit or the costs of replacement parts are things you have to think about before deciding which unit to go for. It’s difficult to give our recommendation as it really depends from case to case. 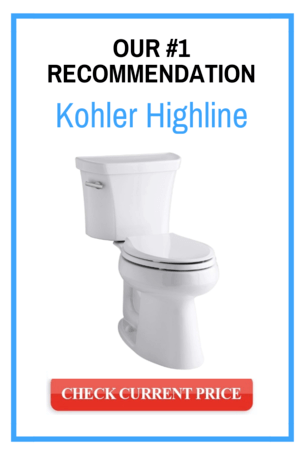 But, if we were to pick just one unit, you simply can’t go wrong with the Kohler K-3949-0 Highline. Comfortable, sleek design, minimal water consumption - simply put, you get exceptional performance. True, some may find it slightly expensive, but you really do get what you pay for with this unit. Feel free to do more research, ask your local handyman or plumber and see what works best for you.